the scenery at work is beautiful i gotta say. so i had my lunch…i feasted on a mushroom swiss burger – no bun of course…with steamed veggies. i took a walk around our man built lake and just chilled under one of the many willow trees we have. willow trees are my very favourite. we have a long history the willow tree and i.
so as i was chillin’ with nature, i ran into our newest residents. the picture is bad because for some reason my “zoom” on my camera isn’t working…but take a look. I could have stayed outside all day! 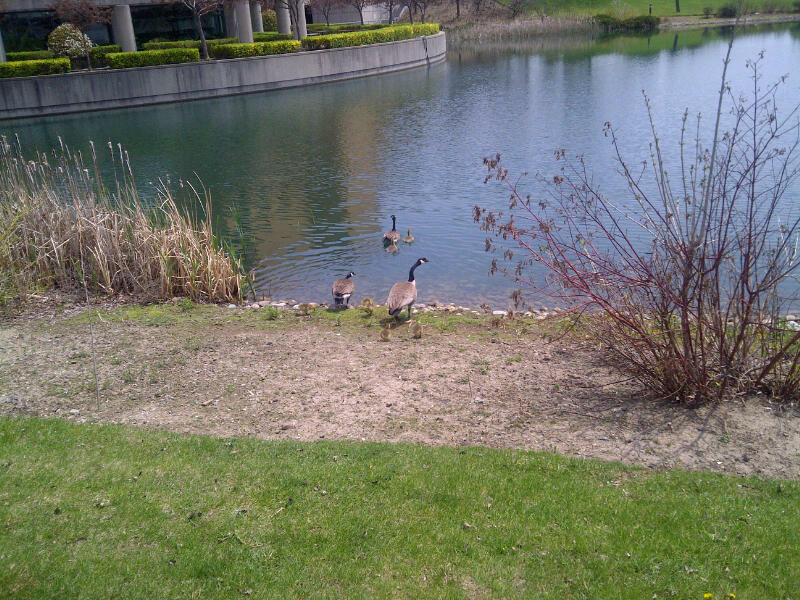 This entry was posted in health, journal, weight loss and tagged babies, blog, blogging, geese, happiness, journal, low carb, lunch, random, spring, thoughts, veggies, walk, willow tree on May 13, 2011 by losing bee. lol, now what did they ever do to you?